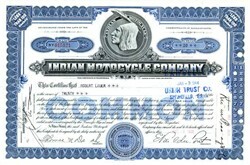 Beautiful SCARCE certificate from the Indian Motorcycle Company issued in 1930. 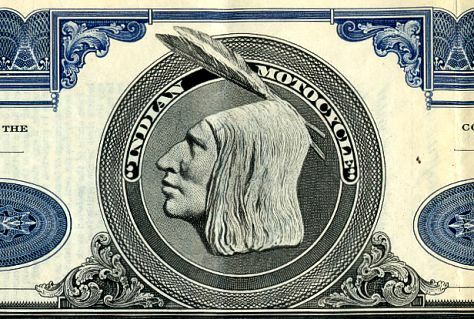 This historic document was printed by American Banknote Company and has an ornate border around it with a vignette of the famous Indian Motorcycle logo. This item has the printed signatures of the company's officers including (E. Paul duPont as President ) and is over 84 years old. Cancelled. The Indian Motocycle Manufacturing Company was a motorcycle manufacturer in Springfield, Massachusetts. 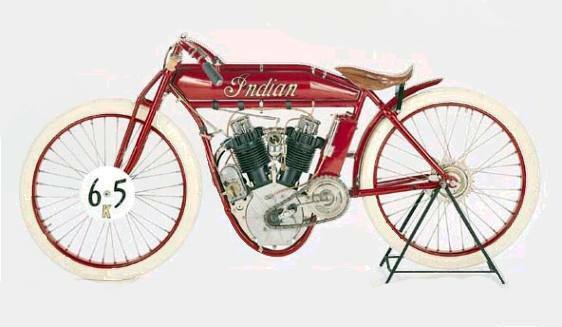 Indian was America's oldest motorcycle brand and was once the largest manufacturer of motorcycles in the world. The most popular models were the Scout, made prior to WWII, and the Chief, which had its heyday from 1922-53. E. Paul duPont started Dupont Motor Car Company in 1919, with their premier at 1919 International Automobile Salon in the Commodore Hotel in New York City. The first cars sold for $2,600. The best known Dupont debuted in 1928, known as the Model G. One of its pioneering features was a grille concealing the radiator. The Model G was not a striking car by any means, but it was very effective and efficient. It was powered by a 5.3 liter straight eight, with a top speed of 100 mph while producing 114 hp. Dupont suffered during the Depression, though, and went bankrupt in 1932. The DuPont company was merged with the Indian Motorcycle Company and E. Paul Dupont took over as President. At the turn of the century a young self-taught engineer and builder of racing bicycles named Oscar Hedstrom designed and built a "pacer" bike, an engine-powered two-wheeler used to train bicycle racers. Powered by a copy of the DeDion-Buton engine, with an excellent carburetor of Hedstrom's own design, the little machine was so practical and reliable that it attracted the attention of a Springfield entrepreneur, George Hendee. They built a manufacturing plant, tooled up, and the first Indians (modest little single-cylinder machines) rolled out the door in 1902. Hedstrom's engineering skill and Hendee's business acumen continued to enlarge their company. A V-Twin was introduced in 1903, updated with two- and three-speed gearboxes, both further refined with swingarm rear suspensions. The first motorcycle with electric start and a fully modern electrical system, the Hendee Special, astounded the industry in 1913. Prior to World War One, Indian was the largest motorcycle manufacturer in the world, producing over 20,000 bikes per year. Indian strongly supported racing during this period as a way to improve their product and to present it to the buying public. The Indian factory machines dominated all forms of racing in the US, and in 1912, Indians won first, second and third at the Isle of Man TT. Hedstrom bowed out of the company in 1913, with Hendee leaving a few years later, and the period between the wars was a time of chaos for Indian. Business misfortune and the lousy management of the financiers that took over the company nearly ruined it. But excellent bikes continued to roll out of the engineering department and, hence, off the production lines. Model such as the much-beloved model 101 Scout of 1919 (Sochiro Honda rode a 101 Scout for many years), the original Chief of 1920, and the highly successful Sport Scout of 1935. Indian also acquired a magnificent four-cylinder bike in 1927 by buying the tools, dies, and assets of the Ace Motorcycle Company. Indian struggled along until 1930, when industrialist, engineer and motorcycle enthusiast E. Paul DuPont took control of the company, which he would run for the next 15 years. Realizing that motorcycles were no longer considered basic transportation, DuPont shifted Indian�s focus to leisure motorcycling, bolstered by competition. This shift, coupled with the birth of AMA Class C racing for production-based motorcycles, helped to keep the doors open during the depression. It was also during this period that stylist Briggs Weaver first penned the daring new streamlined designs that were to become a hallmark of Indian style in the '40s. After the DuPont sold his interest in Indian in 1945, the firm managed to survive for another eight years before a combination of poor management, antiquated engineering and stiff competition from Harley-Davidson and British imports finally closed the Wigwam for good. Ironically, the bikes for which Indian is most fondly remembered�the Chiefs and Sport Scouts with their elegant skirted fenders�were produced in the company's twilight years. Indian and Harley-Davidson both supplied large numbers of motorcycles to the military during World War II, but Harley managed to negotiate much better contracts, and Indian was left perilously cash-poor by the end of the war. To make matters worse, new management decided that the best bet was to trim the product line and develop a line of vertical singles and twins, like the ones that the GI's were bringing home from England. They dropped a model that might have saved them--the brilliant shaft-drive in-line V-twin (similar to a Moto Guzzi) that had been developed during the war--as well as the Sport Scout and the beautiful Indian 4. To fund the engineering of the new models, management borrowed heavily from Brockhouse Ltd. in England. Indian continued producing the Chief model while the new factory was under construction, then subsequently quit building Chiefs at the end of 1948 when the line workers were transferred to produce vertical singles and twins. Unfortunately, the new bikes proved to be failures, not because they weren't the right product for the time, but because they had been hastily engineered and badly produced. In 1950, Brockhouse Ltd. called the debt, divided Indian up into separate sales and manufacturing companies, then sold the pieces to Associated Motorcycles Ltd. (AMC), the British parent company of Norton, Royal Enfield, AJS, Matchless, and Velocette. Chief production was resumed for three more years, 1950 through 1953. The 80 cubic inch Blackhawk Chiefs of these years, with telescopic forks, are probably the most highly coveted Indians of all. Indian dealers sold the AMC models alongside the Blackhawk Chiefs during these years, but in 1954 the venerable V-twin was replaced by a 700cc Royal Enfield model. This machine was fitted with big tires, wide handlebars, and had "INDIAN" painted on the gas tank. AMC dispensed with the Indian marquee in the late 1950's, then closed its own doors in the late 1960's, with Norton the only survivor.